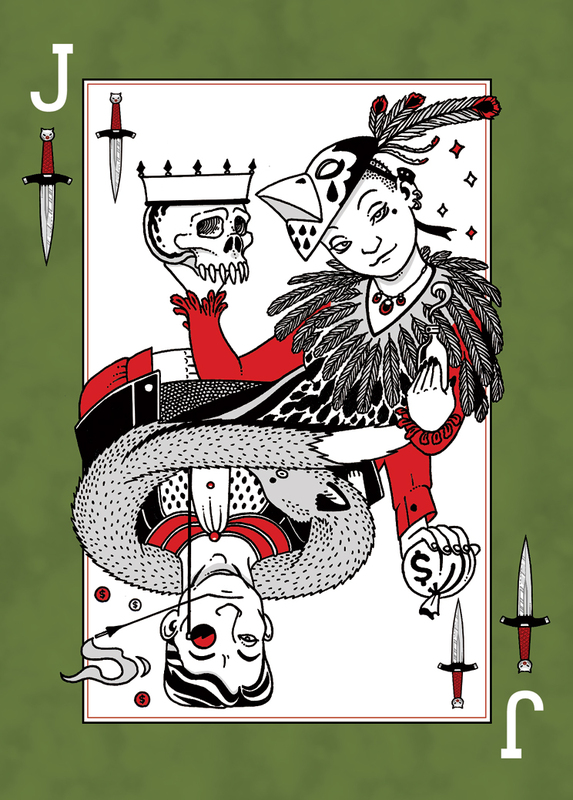 I was recently commissioned by CSFG Publishing to create the cover for their latest anthology, A Hand of Knaves. The cover is still pending design because the submission window only opened today and the editors are waiting to see what stories come in. In the meantime, I have been asked to create a series of speculative fiction inspired knavish Jack cards as promotional material for the impending Kickstarter. 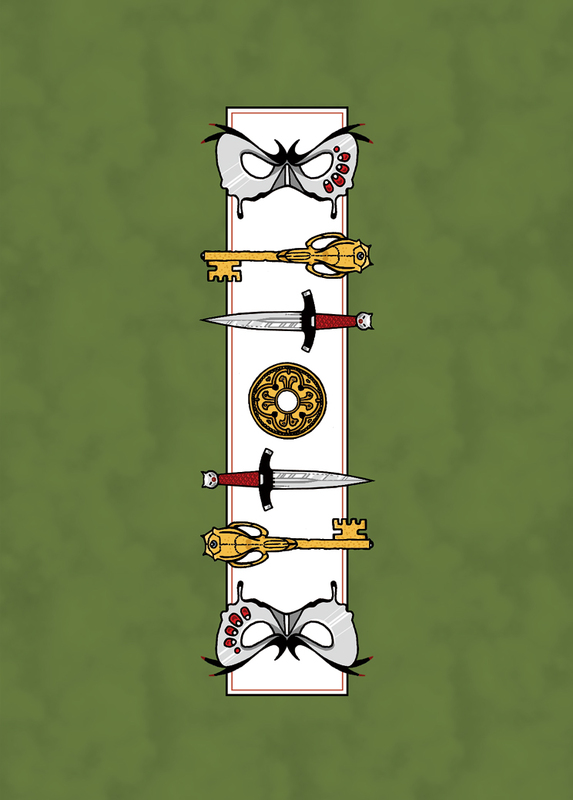 One of the stretch goals is to have an entire deck created. 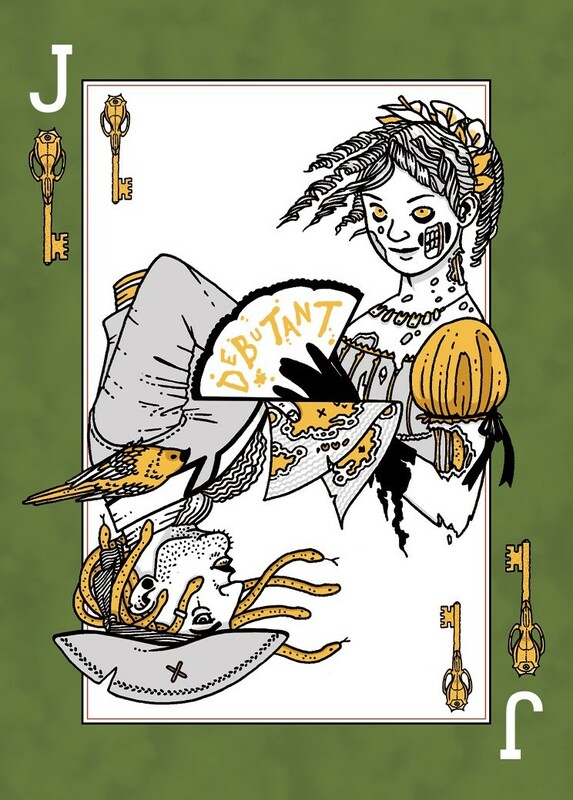 Card 1: This is a horror card of the KEY suit. The top character is a regency-era zombie ala Pride and Prejudice and Zombies. Extra details I added in the design include a necklace of human teeth and tiny rib-bone motifs in the bust of the dress. The flowers in her hair are arum lilies: death lilies. The other character is a medusa-style pirate complete with ye olde pirate hat and neat dress jacket. The parrot is a bird called a sun conure. The key is an old-style key with a rat skull top. 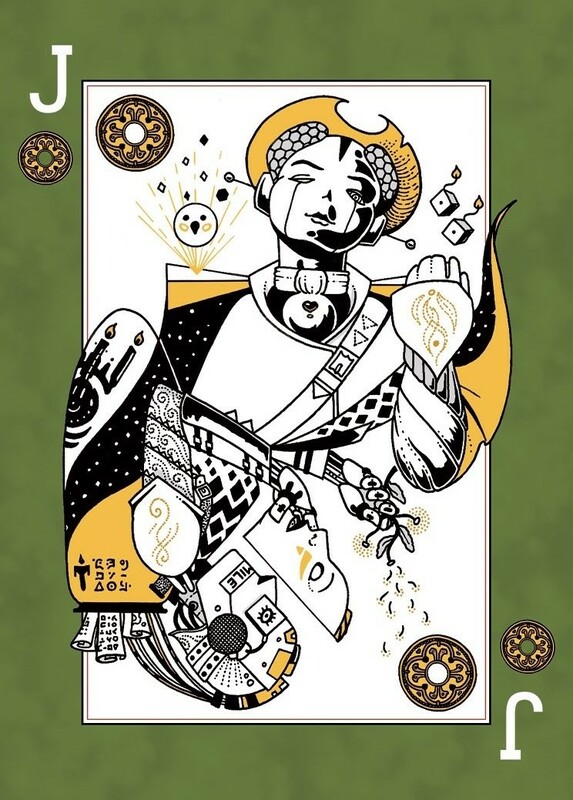 Card 2: This is a science fiction card of the COIN suit. The top character is a wild-west style robot. Extra details include solar-panels on the head, explosive dice and a virtual parrot on the shoulder (being an icon, only the parrot’s head is included: it is essentially an emoji). The lower character is also robotic. This espionage robot uses a false human face to blend in and steal plans. I love the idea of her eyes and mouth being screens on which any design of mouth or eye can be projected. I included a Starship Enterprise influenced design on the gourd just because it was fun. The coins are my own design, with a shape modeled off old Chinese coins. Card 3: this is a fantasy card of the KNIFE suit. This was my first crack at doing a card so is not quite as accomplished as the other two with regard to character merging. The top character is a wealthy poisoner of monstrous kings. The lower character is a Lord who takes from the poor and gives to, well, himself. This will be the back of the cards. It shows the four suits that I have designed: MASK, KNIFE, KEY and COIN.